Arai Signet-Q Zero, UK Flag, & Hydra Helmets! Arai’s Signet-Q gets an exterior overhaul for 2014. Their three new paint jobs have Ridler Award potential. Did we expect anything less? I think not! 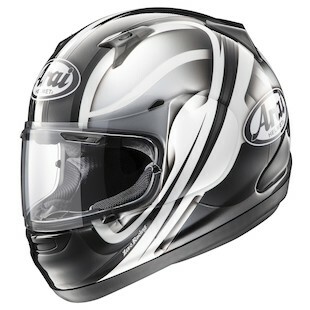 The Arai Signet-Q Zero graphic has sharp definition and bold lines. Every line in this graphic is a path that transports your eyes to a different segment of the helmet’s graphic. You can look at this graphic over and over in fascination, still not completely understanding what it is you’re looking at. Your eyes are constantly traveling around the graphic, trying to find a piece that was previously missed, to piece the puzzle together. 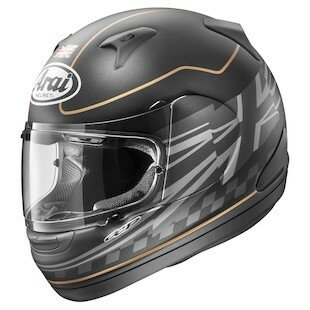 The Arai Signet-Q UK Flag graphic clearly portrays classic European racing roots. It has an earthy, raw, and mechanical feel to it. It’s not flashy. It’s clean and café, with Gold pinstripes breaking up the Frost Black base and containing the flow of the British and checkered flags. 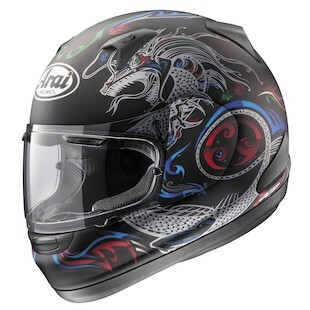 The Arai Signet-Q Hydra graphic takes a page from Greek mythology and adds asian styling. The Hydra graphic shows two pronounced dragons, intricately wound throughout the helmet. Arai added the perfect amount of colored accents, which highlight the dragon’s fluid motion, without diluting the graphics overall impression. These graphics are impressive. Their detail can be distracting. A word of caution...focus on the road, not your mirror.